leased line, and 8:1 compression, amongst many other features, this modem can do virtually anything you could want a modem to do. The new 3460 Global Carrier 56 has been designed to perform mission-critical communications operations, quickly, safely and reliably. When you have to rely on your data transmission, you can rely on Telenetics’ Global Carrier 56. Global Carrier 56 incorporates the latest processor and data compression technology to ensure maximum throughput with minimal overhead on your work station or server processor. Mission critical operations almost invariably involve high data security requirements, so Global Carrier 56 incorporates the latest in security features, including dial-back, password protection, dial-out restrictions and 64 bit DES encryption (Country specific) with Super Secure enhanced key management. 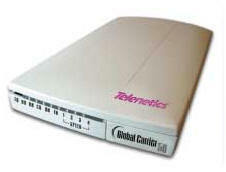 The Telenetics Global Carrier 56 is fully compatible with all data transmission protocols, including 56flex and V.90. Additionally, it includes an extensive command set to ensure compatibility with all hosts. Telenetics Global Carrier 56 will perform in any environment you choose to deploy. It includes support for synchronous and asynchronous communications, as well as for both leased line and dial-up PSTN operation. Globally approved for use in any country. Telenetics Global Carrier 56 comes with Flash ROM, so you can keep your modem up to date and efficient, within the V.90 standard.